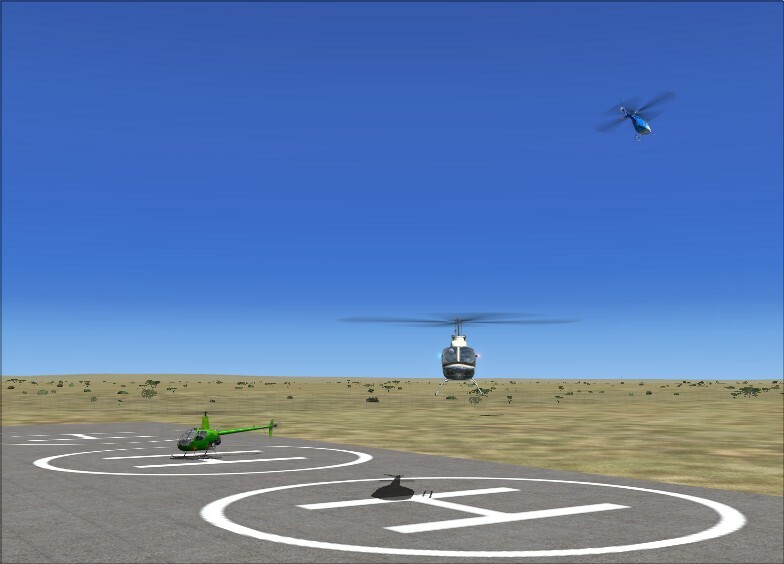 Heli Traffic 2009 is a Flight Simulator module that adds realistic AI helicopter traffic. 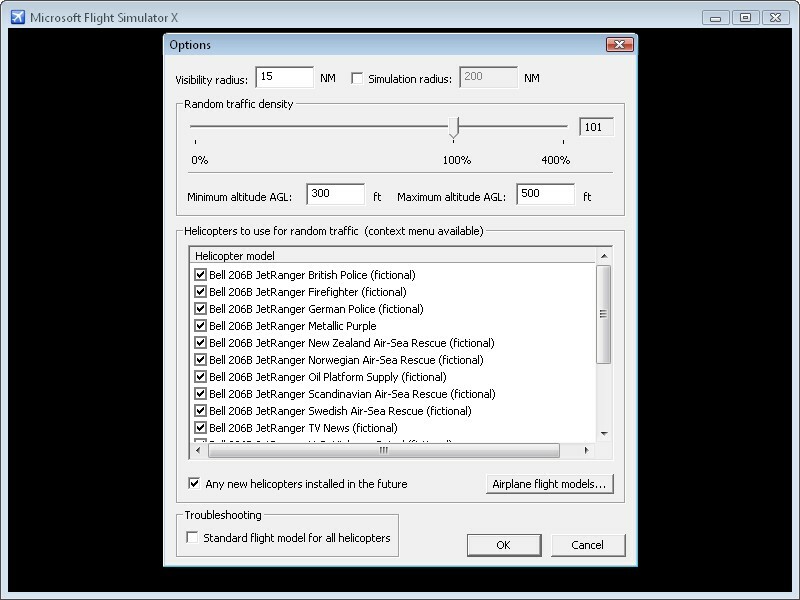 Flight Simulator has supported AI traffic for several years and versions now. While offering realistic fixed wing AI aircraft, Flight Simulator does not natively support AI helicopters. There are a few add-on AI helicopters available, but they all take off, fly and land like airplanes. 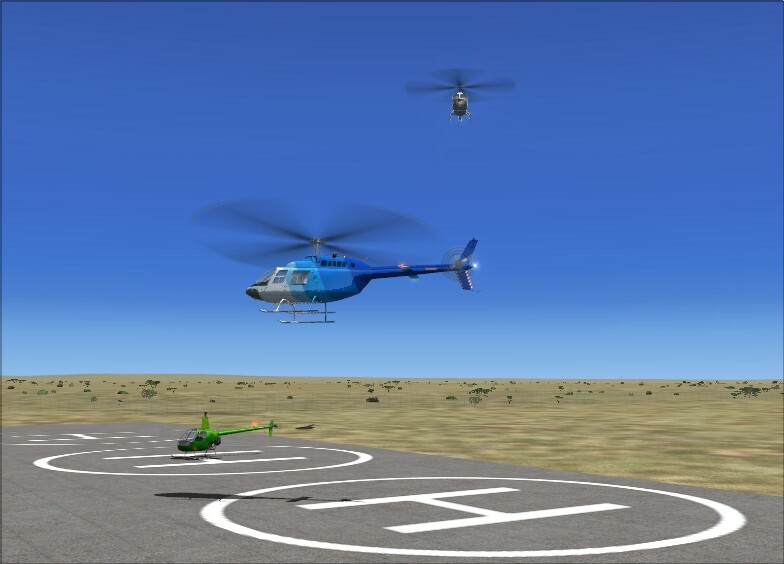 Heli Traffic 2009 is the first Flight Simulator add-on that adds realistic AI helicopters that take off and land vertically, fly like helicopters and use helipads and not runways. This innovative product brings it's own AI engine that fully controls AI helicopters, instead of relying on FS to fly them. This allows a much greater degree of control, which translates into a realistic helicopter flight behavior. Heli Traffic 2009 uses airport helipads for takeoffs and landings. Both stock and add-on airports are recognized. 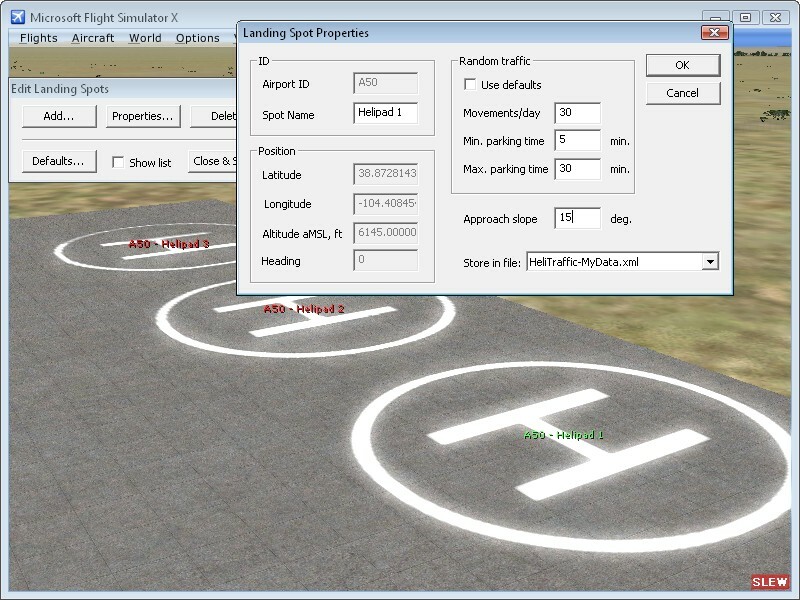 You can also define additional helicopter landing spots from within the program. Or you can add helipads to your airport with our Airport Facilitator X product - and Heli Traffic 2009 will automatically recognize and use these helipads. For each helipad, you can set a few parameters like the helipad name, the desired traffic density, average parking times and the approach slope. Heli Traffic 2009 generates random and scheduled helicopter traffic. For random traffic, you simply set the desired number of movements at individual helipads. 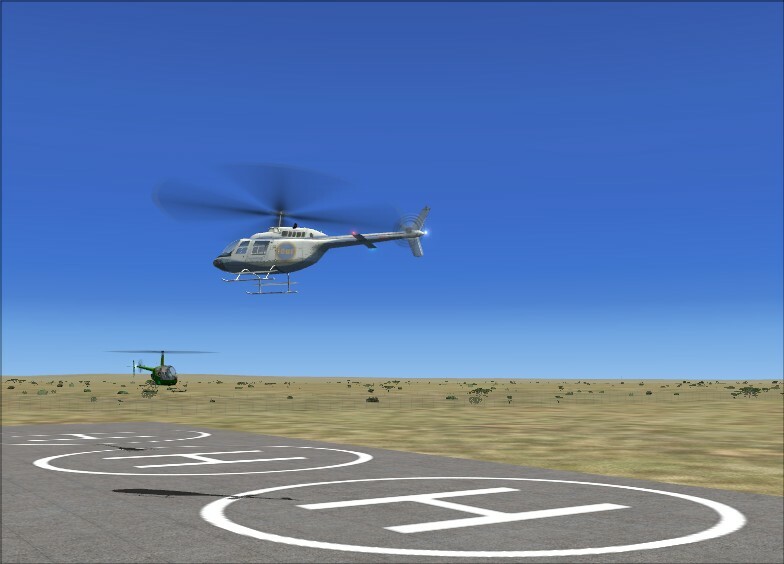 Heli Traffic 2009 will plan and execute helicopter flights that match your settings at each helipad in the best way possible. You can also add scheduled helicopters that fly pre-defined routes. To add a scheduled helicopter, you just select the helicopter model to use and specify any number of helipads/landing spots to visit. The helicopter will perform flights between these helipads according to your schedule. For each scheduled helicopter, you can define the desired cruising altitude and airspeed, instead of using the default values. For even greater control, you can specify enroute waypoints for scheduled helicopters. 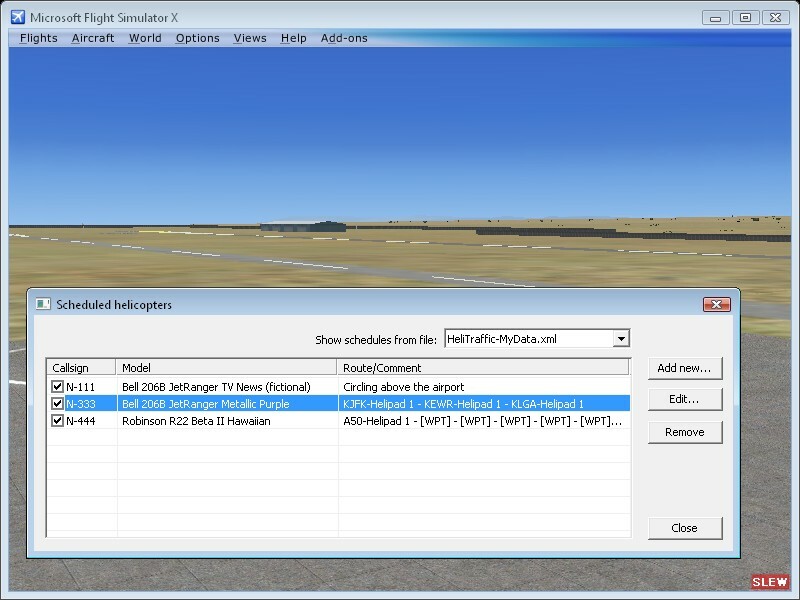 This allows you adding scheduled helicopters with more complex behavior than just flying from helipad to helipad. For example, you can add a sightseeing helicopter that takes off from a helipad, flies a pre-defined route over interesting landmarks in the area and lands at the same helipad. Or what about a TV news or police helicopter monitoring the city streets below or circling above a stadium? The possibilities are endless. Heli Traffic 2009 can use every stock and add-on helicopter installed in FS. In addition, it can use existing add-on AI helicopters that come with airplane flight models. 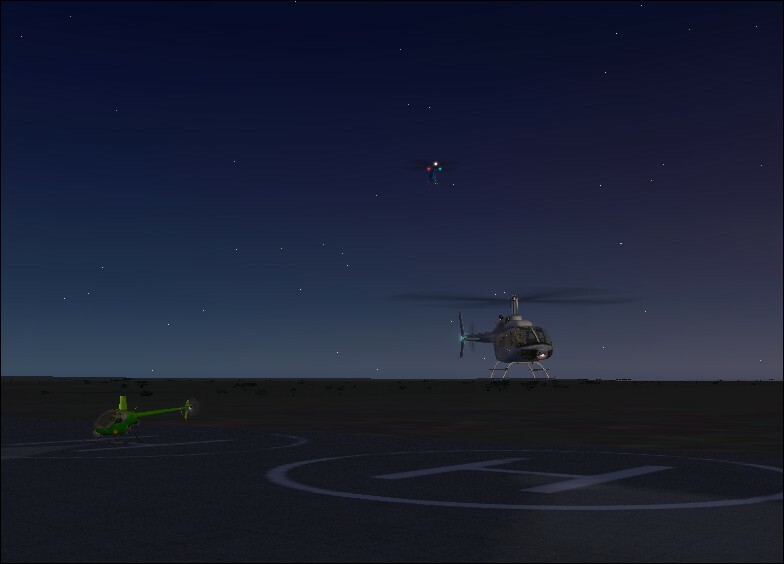 You can select helicopter models to be used for random traffic, as well as the model of every scheduled helicopter. A built-in frame rate tester allows you to quickly test the frame rate impact of individual helicopters. 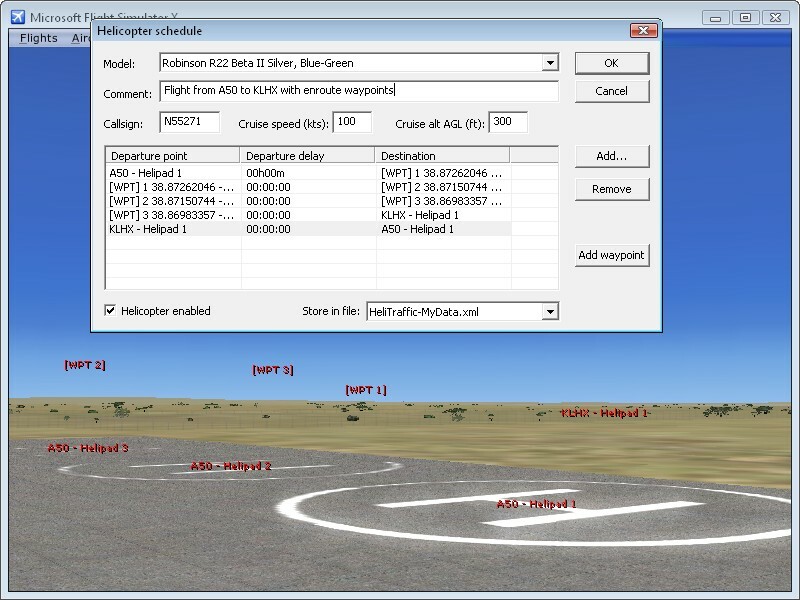 To control the frame rate impact, you can set the visibility radius for AI helicopters in program options. You can easily organize your helipad/landing spot settings and schedules into several individual files and share them with other users. Unprecedented realism:Creates AI helicopters that take off and land at helipads, hover, and fly like helicopters, not like airplanes. Fills your sky with helicopters:Generates random point-to-point helicopter traffic to match individual traffic density settings at each helipad. 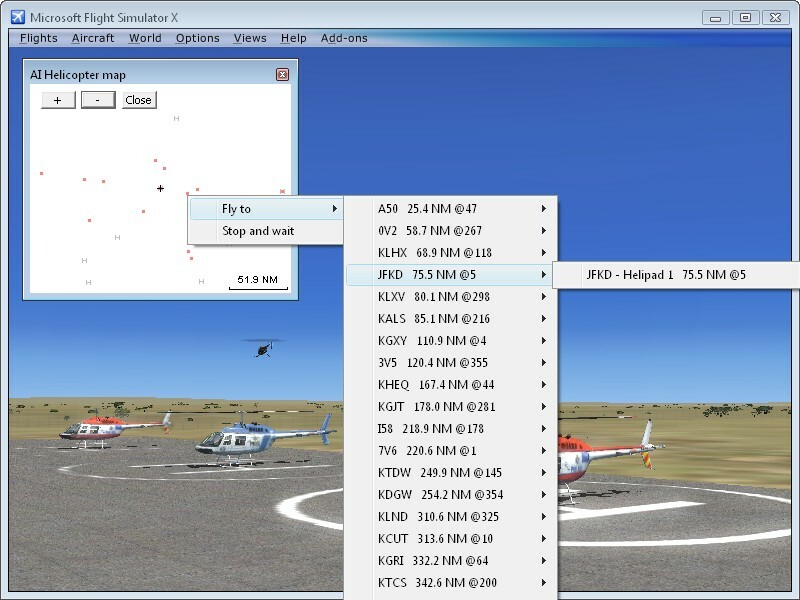 You can select helicopter models and the range of altitudes to be used for random traffic. The global traffic density setting allows you to increase or decrease all random traffic by a given factor. Set up your own routes:Supports scheduled helicopters that fly fixed routes defined by the user. You can set the desired cruise altitude and airspeed for each scheduled helicopter. Make helicopters fly like you want:Allows specifying enroute waypoints for scheduled helicopters. Each waypoint defines both a geographical position and the altitude. You can also define circular routes without helipads for helicopters that never land. Uses every helicopter installed:Uses every stock and add-on helicopter you have installed for AI traffic. Also supports add-on AI helicopters that have airplane flight models. Uses all helipads in the scenery:Uses helipads defined in stock and add-on airport files. Helicopters can land everywhere:Allows specifying additional helicopter landing spots from within the program. Easy per-helipad settings:For each helipad/landing spot, you can specify the desired number of random traffic movements, minimum and maximum parking times and the approach slope. Share your work:Files with landing spots and schedules can be easily organized and shared among users. Try the Helitraffic demo to get a taste of what the full version is like! Watch Heli Traffic 2009 in action by clicking the video below. Heli Traffic 2009 from Flight One Software on Vimeo. The E-Commerce enabled download executable is about 3.4 MB in size. The purchase screen will appear when you run the executable. The servers do support Resume, however we do not recommend certain download managers because they can sometimes corrupt large downloads. For support on this product, please visit the HeliTraffic 2009 forum.